Praise for the Book – Trust the Loving Universe! Here are a few of the comments we have received as people read The Trust Frequency book. 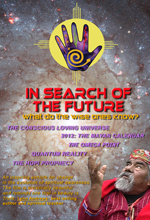 We published the book on December 21st, 2012, the last day of the Mayan Calendar and the long-awaited date of the predicted 2012 consciousness shift. This praise came in the first few weeks after publication. Needless to say, we are delighted with the response from these leading thinkers in the field of consciousness transformation and personal development. The Trust Frequency is one of the most brilliant, consciousness-transforming, perhaps even life-changing books I have ever read. It is clear when reading this masterpiece that the two writers are extraordinarily great souls with a cosmic and divine view of this world. It will be a blessing in anyone’s life who reads it. What impresses me most about the The Trust Frequency is that it is written from a higher dimensional awareness and clarity that energetically transfers to the reader. It explains the shift in consciousness unfolding on our planet and how everything is frequency and vibration, and how by releasing old assumptions we can choose to vibrate at the higher frequency of love and trust and move into the heart of Oneness. It leaves us with the inspiration and recognition that this is our destiny. A wonderfully lucid guide to living more fully and deeply on this Sacred Earth by two loving and highly evolved conscious guides. 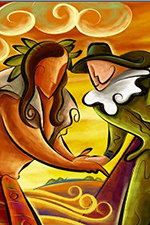 The Trust Frequency is good medicine for all those seeking more fully human lifestyles and a global culture of peace, generosity and sustainability for our common future on this wondrous planet. This is a wonderful book. So incredibly wise. How did you and Andrew get to know all this stuff? I am learning inch by inch, and then backwards and then forwards, that I actually have the freedom to be this happy. It’s a slow journey for me, but I’m seeing a lot on the way. I love the way you and Andrew have written this book. The words have kindness in them besides huge intelligence. I was blown away by Jeannie Russell’s “No More Victim” story. The bravery out around us today is awe inspiring. It helps me with my own journey. It’s all about community no matter how individual we are in ourselves. Exciting. Truly exciting. And you have been trying to nudge us to go in the best and only direction for most of your life. Thanks for forging the way. You are heroic. Is it possible there is a magical frequency of love that exists for all of humanity 24 hours a day no matter where we are and what we are doing? 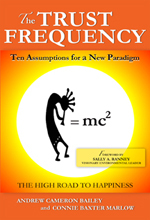 Bailey and Marlow describe such a place in their new book, The Trust Frequency: Ten Assumptions for a New Paradigm. They liken it to the place the Buddhists call Nirvana, the place that mystics through the ages call “Heaven on Earth.” But how do we get there from here? It’s all about the state of our consciousness and where we choose to focus the one thing we actually have the ability to control: our thoughts. 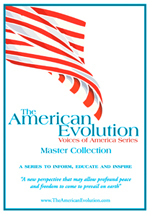 Written in a conversational tone and filled with quotes from spiritual leaders, scientists, poets, and mystics through the ages, this book provides a strong foundation for the theory that humanity is evolving, that we are bubbling with the potential to burst forth into a whole new way of vibrant living: present, alive, and full of grace. I read your whole book in two days. I wished it wouldn’t end! The passion and commitment that you bring to the perspective of the Conscious Loving Universe will serve to open the door for many into the freedom to truly enjoy our human experience. You have walked your talk and I appreciate your victory. The new story starts here! Congratulations. For all those people who are awakening to the call of the new energies that are emerging on the planet as the potential to transform our consciousness and the way we live our lives, The Trust Frequency is for you. For all those who have not yet started to awaken, please read this book to help open your hearts and minds. In the myth of ‘Spider Woman,’ the Amerindian Creation Goddess, it is told that she created all the races of the world and spun a thread that connected all to her and to each other. In essence, The Trust Frequency reminds us of that thread and encourages us, in direct and practical ways, not only to reconnect, but to learn how to play this thread for the beautiful frequency it can produce as a part of the great harmonic symphony of the New Paradigm, which honors the spirit in all things. Penny Slinger, artist, spiritual teacher. I read The Trust Frequency out loud to Jim last night, curled in front of the fire. So honored to have had a copy signed and hand delivered by you and Connie! As always such a delight to spend time with you two. You have written a magnificent book! I’m just loving your book. Fantastic and right-on and such a wonderful easy read. Highly impressed! It is my life’s journey to learn to return to that internal place of clarity and creativity, trusting that all is unfolding exactly as it should and that we are all loved and supported all the time. This book, The Trust Frequency, is exactly what I needed to to help me clear the old belief systems and to reinforce the trust that I want to lean into. There are so many habits of thought within me and limiting influences in the collective thought forms, that, for me, it is necessary to have support systems like this book to help move me in the direction of more freedom. The way that you talk about “circumstance” was a totally new idea for me and particularly helpful. Thank you!